we offer free estimates along with a variety of spray foam insulation options to suit your residential, commercial, and/or industrial needs. Good Insulating Properties. Open cell ½ lb. foam is sprayed onto walls as a liquid before it expands into a soft foam. We then trim off the excess. Open Cell Foam Structures are air tight without the rigidity of the Closed Cell Foam. Economical with good insulating properties. 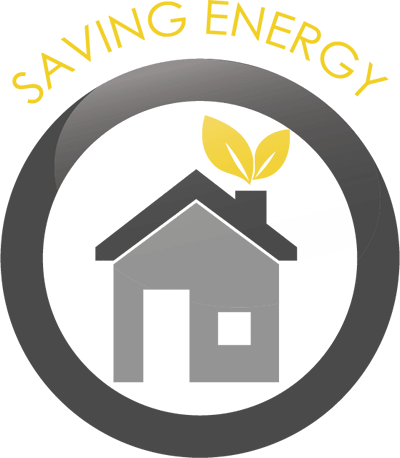 ECII cellulose is blown into both new construction attics and for “top-off” service. Usually blown in at 16” for R-60 initial and approximately R-48 settled for residential construction, which meets the Energy Star Recommendation. Excellent Insulating Properties. Closed cell 2 lb. foam is sprayed onto walls as a liquid before expanding into a hard foam. 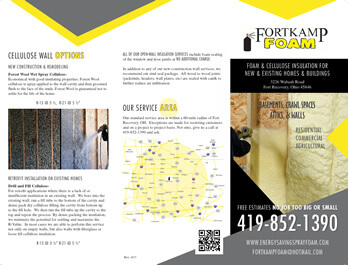 Closed cell foam is completely air tight, moisture proof, guaranteed for the life of the home owner and actually adds strength to the building it is installed in. Economical Air Sealing. 2 lb. Closed Cell Foam is sprayed ¼” to ½” thick to seal stud cavity and any cracks or penetrations in walls. We then install Fiberglass Batts. This takes advantage of the air sealing properties of spray foam and the lower cost of the fiberglass insulation. Our standard service area is within a 60-mile radius of Fort Recovery, OH. Exceptions are made for recurring customers and on a project to project basis. Not sure, give us a call at 419-852-1390 and ask. GET A COPY OF OUR BROCHURE TODAY!